You might have noticed the stuffed mice that Autumn carries around with her in many of the photos on my blog. I almost bought her this Mouse (from the book If You Give a Mouse a Cookie) while strolling through Kohl's two Christmases ago. I even let Autumn carry it around in the store while I shopped, but at the last minute I decided not to buy it since it was so close to Christmas and it wasn't in our budget. About a week later, my mother-in-law Christie who knew nothing of our trip to Kohl's, sent the kids a package. When we opened it, we were surprised to find not one, but TWO mice. They were the exact ones that Autumn fell in love with at the store, except Christie had carefully sewn lace on the cuffs of one of the mice and added a sweet flower to her "hair" to make one mouse a boy and one a girl. Autumn was smitten. Everyone who knows us, knows Autumn's Mousies too. Since there are two of them, we sometimes leave one behind when we visit friends, because if we see one, then we assume that the other must be in the car...or at home. Autumn takes great care of her Mousies, but they always find a way to run off on adventures of their own, as Mice are prone to do. So far, thanks to the kindness and thoughtfulness of friends and strangers, Autumn's Mousies always find their way home again. 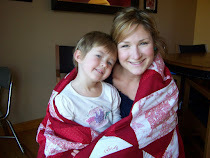 At the beginning of June, three weeks before Guy lost his blankie, I took the kids to the doctor for a check-up. Unbeknownst to us, Autumn left one of her Mousies in the waiting room. Later that morning, our friend Amy Jo went to the same doctor's office for an appointment with her kids. Her 18-month-old daughter Lillian, spotted Mousie immediately and made a b-line for the beloved mouse that she and Autumn often compete for at our house. Amy Jo immediately recognized it as Autumn's mouse, so she rescued Mousie from the waiting room with plans to return it to us. But first, they did some shopping at Walmart. Lillian hugged and loved on Mousie during the entire trip. Then she dropped it somewhere in the store. Mousie was once again left to the mercy of strangers. A cashier spotted the mouse, heavily-laden with signs of affection, scooped it up and placed it on the check-out lane, thinking that surely the owner of this mouse would return for it. A few minutes later, my friend Jacquie showed up at Walmart. She walked right past Mousie sitting on top of the bagging rounder and said, "That's Autumn's Mouse!" After they finished their shopping, Jacquie showed up at my door. She was just beaming as she held out Mousie to me. And we beamed back. Life is pretty incredible sometimes, isn't it? And so are good friends and guardian angels of children's special companions! with some identifying information, before their luck runs out! What a cute story, Jocelyn! good idea with id tags...sure glad it isn't the kiddies that are missing...lol! That was a lovely sweet story. Just another proof that Angels are among us. I'm so glad she got her mousie back!!! That story would make an adorable children's book, even if it was just for Autumn. What a good story! So sweet. My frist two never had a special blankie or toy, but my youngest still does and she is 8. Ha! That is a great story. I'm so glad they always find their way home. There was some cute labeling ideas in Martha Stewart this last month. Your door must be open to many, many people for them to know your children well enough to recognize their dear ones. That story is incredible (and pretty adorable)! Heavenly Father must really have a soft spot for Autumn's mice. Those are so amazing!! I am sure she loves them. If you give a mouse your heart . . . [many adventures in which your friends recognize your special relationship] . . . you mouse will always find its way home to you. My kiddoes never had toys or blankies -- I'm kinda sad after reading all your adventures. Oh man! The irony! Isn't that great? I remember one time when I lost my wedding ring and I thought I misplaced it in the parking lot of the grocery store. I was so sad and so distraught but I said a prayer and felt a little nudge to look through all my grocery bags again. I found it it and I was so grateful. The Lord really knows each little detail of our lives and that is so sweet that your friends found Autumn's mouse.